For example there may be 4 adapters in the sub-system. 1 of adapter type A, 2 of adapter type B, and 1 of adapter type C. Note that the HPI audio sub-system is only concerned with AudioScience adapters. All AudioScience adapters have a unique adapter number associated with them. This is physically set on the adapter using a jumper or switch, in a manner similar to the device ID setting on SCSI devices. Each audio adapter is made up of 0 or more output_stream(s) and 0 or more input_stream(s). An input_stream is a source of digital audio (record) and a output_stream is a destination for digital audio (playing). A stream can record/play digital audio with specific attributes of channels, sample rate and format. The number of channels a stream is usually either be (mono) or 2 (stereo). In the case of a forrmat such as DolbyAC3, the number of channels would be 6. Each adapter also contains a mixer, which routes audio signals between the in/out streams and the physical inputs and outputs on the adapter. A mixer contains controls that serve to alter and route the audio signals as they pass through. Examples of controls include volume and meter. For example an adapter may have three output streams, but only two physical (stereo) outputs. The mixer would combine the audio signals from the three streams to send to the two physical outs. This is shown in the following diagram. 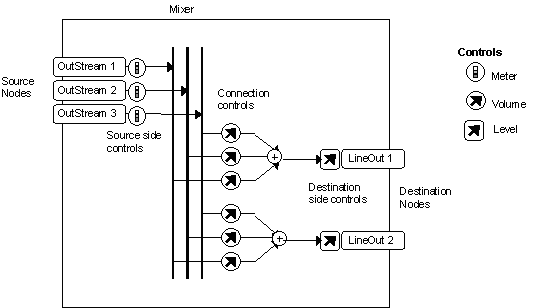 Mixer controls can be located in one of three places: source side, on a connection (between a source and destination) and destination side. In the previous diagram you can see that the meter controls are source side, the volume controls are on a connection between a particular source and destination and the level controls are on the destination side.